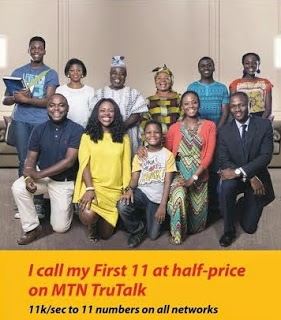 Did you notice the slight change in MTN Truetalk? MTN reviewed the plan of recent and instead of reducing, increase the call rates a bit. They also disabled the TrueTalk+ tariff plan which majority had earlier switched to on launch. And as it stands, the plan is no longer working or available for migration. Don't be confused when I say MTN TrueTalk plus or tariff plan is canceled. As the TrueTalk plus tariff plan and TrueTalk are not the same - there are slit difference between them. But we will not go in details to that because this post is channeled to TrueTalk alone. Since it is active for users to subscribe to. So for all about the new mtn tariff plan check below. MTN TrueTalk offers it subscribers a flat call rate when calling any network, having that your sim is already migrated to the plan. The flat call rate is given to be 20kobo per seconds to all network. To send SMS to any number or any network, truetalk charges only N4 for each SMS you sent to friends. Once you are on truetalk, you are eligible to get free 10mb from the recharge of N200 and above.The 10mb can be used to chat on any social media or browse on any browser of your choice. However, the validity of the 10mb is 2days only. After the 2days, your data will be wiped if not exhausted and you can easily get another one after recharging N200 and above. To activate or migrate to MTN truetalk tariff plan, just dial *400# or text 400 to 131. The activation is free of charge. After that, you will receive a success reply from MTN saying, the migration was successful. And your screen will appear as seen in the below image when you check your account balance. ==>Dial *400# or text 400 to 13. 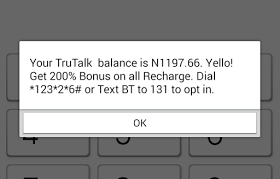 With that said, that is it on MTN truetalk tariff plan. Go through it to see if it suites you before migrating.